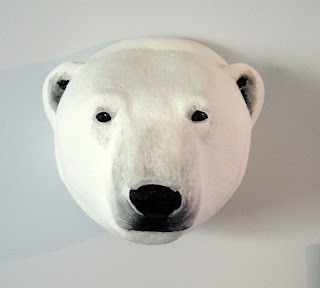 A polar bear trophy head.. Why Not? In the fall I took a sculpture course that was geared toward creating pieces with stryofoam and lost wax in order to eventually get a piece bronzed. I have previously shown the naked lady sculpture I did in that course, but the second weekend, I wanted to do something I could give my husband for christmas, so I carved a polar bear trophy head. 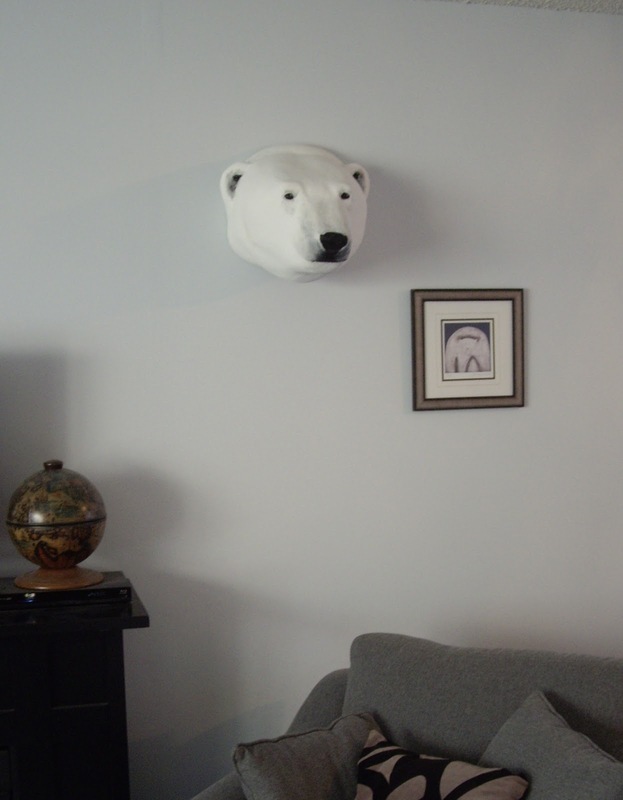 Yep, Awesome christmas gift, because who doesn't want a massive polar bead head on a wall? 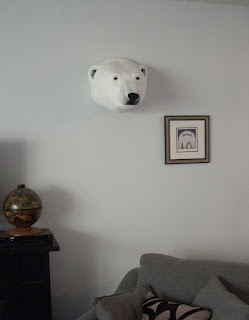 I knew my hubby would like it because he is big fan of polar bears, so I used the techniques I learned and created it. Instead of covering the piece in hot wax to prepare it for a lost wax bronze sculpture technique, I covered it in several layers of plaster. This probably wouldn't work for theatre, as things in theatre need to be sturdier than just plaster, however, I knew that just on our wall it would be fine. I covered it in plaster and used the plaster to get a little bit of a slick fur effect. 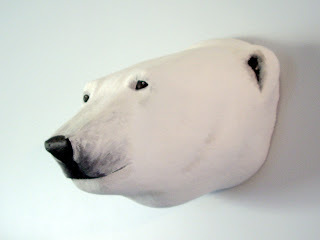 Now you need to sculpt a big polar bear arm that you can make look like it's clawing it's way out of the wall to git you. That is a great idea...I will have to think about that one. He doesn't look particularly gnarly though, mayb inquisitive. So maybe an inquisitive paw? ha. Too funny. The Trees that find root : Quiller Trees!